This is the love language of both my husband and my son. This is the second love language discussed in The Five Love Languages of Children . Words of Affirmation doesn’t only apply to children who can understand what you are saying. Chapman and Campbell point out that long before children understand the meaning words, they understand tone of voice and body language. Remember last week when I talked about communication and how less than 10% of the message communicated is through the actual words you say? Words of Affirmation doesn’t mean you only say nice words and that your body language doesn’t matter at all. It all comes together to send a message. You can combine your words with a smile, a hug, a pat on the head, a tickle, a high five…don’t depend on the word by itself because that is not the way communication works. These are in the category of Words of Affection and Endearment. There are a few categories of words Chapman and Campbell suggest you focus on as a parent, the first being Words of Affection and Endearment. Throw little pet names in the mix. Sweetie, honey, princess, etc. are all words that show endearment. The second category for words is Words of Praise. “Praise…is for something over which the child has a degree of control” (page 47). As you offer praise, you want it to be genuine. It is a good idea to use specifics over generalities. Rather than saying, “You are a good girl” say, “You are a good girl for picking up your toys without being asked!” Also, don’t give praise that isn’t true. Children know if something they did was so-so. If you lavish praise for the average, he might not believe sincere praise when it comes. You also don’t want to teach your child praise is necessary for every step–becoming addicted to and dependent upon praise. Just make sure the praise is true and justified. “Otherwise they may regard it as flattery, which they can equate with lying” (page 47). Another category for words is Words of Encouragement. We want children to have the courage to try more. Remember that almost everything your child does in life is new to him. When you see your child do something right, tell him what he did and why it was good–why you value it. An example from the book is if you see your child share. You would later tell your child that you noticed him share his toy with Bobby. Tell him you like that and why sharing is valuable. The idea here is to catch your child doing something right and and commend him for doing so. Words of encouragement are great for helping develop morals and ethics. Chapman and Campbell caution that “The greatest enemy toward encouraging our children is anger” ( page 48). We must temper our anger. We must use quiet, soft voices. Speak pleasantly. Is it easy? No–not always. Make the effort. The final category of words is Words of Guidance. I think one of the most powerful statements in this book is, “All children are guided by someone” (page 50). If you, the parent, do not step in to be that primary guide, something else will. It might be the television. It might be school. It might be other adults, or perhaps other children. I think we, as parents, all want that primary guider of our children to be us! Correct guidance is for the benefit of the child, not to make the parent look good. You don’t guide your children toward proper behavior in order to look like a great parent; you are teaching your children proper behavior because it is right and will help him in his life. As you guide, you need to be sure you are a good example of what you are teaching. You also want your guidance to be overwhelmingly positive. Don’t focus so much on what they can do as what they can. Keep guidance as positive as possible. Say I Love You, and say it alone. Don’t tell our child you love him then ask him do to something. Don’t tell your child you love him and follow that up with “but…” Leave “I Love You” as an unconditional statement. This doesn’t mean you can’t ever ask your child to do something or tell him he shouldn’t do something. It means you don’t do so coupled with “I love you.” Leave “I love you” alone. Keep a journal. Chapman and Campbell suggest that if you have a hard time speaking words of affirmation, you keep a journal and write down positive words. Record ones you hear from other parents, ones you read in books, and ones you think of on your own. Then look for opportunities to say these words to your child. Use words of affirmation at least three times each day. Do not lecture or condemn. Trust me when I say that with a person whose love language is words of affirmation, you will get a lot more reaction from focusing on what you like than what you don’t like. With both my husband and my son, things go much better if I say nothing about what I am not liking and praise and encourage all that I do. They get that encouragement and they want to do more good. Negative talk brings them down and seems to ruin all motivation. Now, sometimes, yes, you do need to point out what is being done incorrectly. That will need to happen at times. Just make the effort to focus on positive talk and I promise you will see a world of difference. Apologize. If you say something hurtful, apologize for it and ask forgiveness. 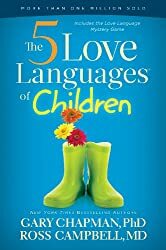 “…it is essential for parents and other significant adults in the child’s life to quickly apologize for negative, critical, or harsh remarks” (page 55). Don’t get angry. Keep your voice and emotions in check. Again, remember that all children need to feel love in all five languages. Even if your child doesn’t have this as a primary love language, work to have these tips as part of your life. Who doesn’t love being told they are great? Previous Post Poll Results: What Book Topic Would You Like To See From Me? My primary language is words of affirmation too. I agree completely with all of your points. When I grew up I never hear anything I did well. But I did hear a lot of words condemning my behavior. Now I operate with guilt for each thing I do wrong. Anytime someone "comes down" on me I hear failure and a horrible lack of motivation. I am a firm believer in the love languages. My husband is Acts of Service. He finds so much pleasure in me paying bills and calling to take care of credit cards or things like that. I enjoy doing those things now because I know the happiness it brings. We hope to foster an environment with our daughter using her language, whatever it may be…. I love these short summaries of the points in the love languages book, it helps to remind me to check and see if I am doing those things as a parent. I'm definitely not a words of affirmation love language but my husband is so this is one I've had to learn a lot about. Lindsay, thanks for sharing your thoughts as one who has this love language! Amanda, I know, I am not a words person either. I don't mind nice words, but my policy is if there is a problem, I will let you know. Otherwise, assume it is good–no news is good news 🙂 I have to focus hard on offering words of affirmation for my boys. They need it.